As civil wars engulfed several Central American countries in the 1980s, hundreds of thousands of Salvadorans fled their country and came to the United States. Between 1980 and 1990, the Salvadoran immigrant population in the United States increased nearly fivefold from 94,000 to 465,000. The number of Salvadoran immigrants in the United States continued to grow in the 1990s and 2000s as a result of family reunification and new arrivals fleeing a series of natural disasters that hit El Salvador, including earthquakes and hurricanes. By 2008, there were about 1.1 million Salvadoran immigrants in the United States. Salvadorans are the country's sixth largest immigrant group after Mexican, Filipino, Indian, Chinese, and Vietnamese foreign born. 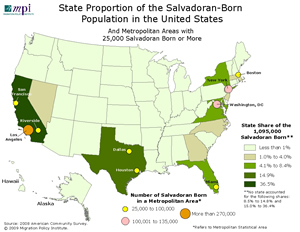 More than half of all Salvadoran immigrants resided in just two states, California and Texas, although they are also concentrated in New York, Maryland, Virginia, and the District of Columbia (for more information on immigrants by state, see the ACS/Census Data tool on the MPI Data Hub). Foreign-born men and women from El Salvador have higher rates of participation in the civilian labor force than immigrant men overall. They are also heavily concentrated in construction and services. This spotlight focuses on Salvadoran immigrants residing in the United States, examining the population's size, geographic distribution, and socioeconomic characteristics using data from the U.S. Census Bureau's 2008 American Community Survey (ACS) and 2000 Decennial Census, and the Department of Homeland Security's Office of Immigration Statistics (OIS) for 2008. There were 1.1 million foreign born from El Salvador residing in the United States in 2008. About one of every five Salvadorans resides in the United States. More than half of the Salvadoran born resided in California and Texas. Salvadoran immigrants made up 15 percent of all immigrants in the District of Columbia in 2008. Between 2000 and 2008, 10 states saw the size of their Salvadoran immigrant population grow by more than 10,000 people. Nearly two-thirds of Salvadoran immigrants resided in six metropolitan areas. Over one-quarter of all Salvadoran foreign born in the United States arrived in 2000 or later. Four of every five Salvadoran immigrants in 2008 were adults of working age. Salvadoran immigrant men outnumbered women in 2008. The majority of Salvadoran immigrants were not U.S. citizens in 2008. Seven of every 10 Salvadoran immigrants in 2008 were limited English proficient. More than half of Salvadoran foreign-born adults did not have a high school education. Salvadoran immigrant men and women were more likely to participate in the civilian labor force than foreign-born men and women overall. Nearly 40 percent of employed Salvadoran-born men worked in construction, extraction, and transportation. About 45 percent of employed Salvadoran-born women worked in services. There were about 340,000 Salvadoran lawful permanent residents (LPRs) in 2008. Over three-quarters of Salvadoran-born lawful permanent residents in 2008 were eligible to naturalize. Most Salvadoran LPRs entered through family sponsorship or as the immediate relatives of U.S. citizens. About 229,000 nationals of El Salvador were eligible to reregister for Temporary Protected Status in 2008. In 2008, 5 percent of all unauthorized immigrants in the United States were from El Salvador. The number of unauthorized immigrants from El Salvador increased 35 percent between 2000 and 2008. There were 1,094,993 foreign born from El Salvador residing in the United States in 2008, making up 2.9 percent of all immigrants (see Table 1). The population has increased more than 12-fold since 1980, when the decennial census counted 94,447 Salvadoran immigrants, and more than 70-fold since 1970, when there were 15,717 Salvadoran-born in the United States. Up until 1990, the foreign born from El Salvador ranked behind most foreign-born groups in terms of size (see Table 1). For instance, in 1980, the number of Salvadoran born in the United States (94,447) was about half the size of the immigrant population from Jamaica (196,811) and comparable to the foreign-born population from the Netherlands (103,136). By 2008, the Salvadoran-born population was more than double the size of the Jamaican-born population (636,589) and 13 times larger than the Dutch immigrant population (85,635). Between 2000 and 2008, Salvadorans surpassed Cubans as the second largest immigrant group from Latin America (after the Mexican born) (see the pie charts showing the top 10 countries of birth of immigrants residing in the United States over time here). The Salvadoran born in 2008 were similar in size compared to the Vietnamese born (1.1 million) and the Korean born (1.0 million) but smaller than the immigrant population born in mainland China (excluding Hong Kong) (1.4 million). Notes: a Rank refers to the position of the Salvadoran born relative to other immigrant groups in terms of size of the population residing in the United States in a given census year. Source: Data for 2000 from the 2000 census; data for 2008 from the American Community Survey 2008. Data for earlier decades from Gibson, Campbell and Emily Lennon, U.S. Census Bureau, Working Paper No. 29, Historical Census Statistics on the Foreign-Born Population of the United States: 1850 to 1990, U.S. Government Printing Office, Washington, DC., 1999. Available online. California had the largest number of foreign-born residents from El Salvador (399,204, or 36.5 percent of the total Salvadoran-born population) in 2008, followed by Texas (163,014, or 14.9 percent). The next four states with large Salvadoran-born populations accounted for an additional one-fourth of Salvadorans residing in the United States: New York (91,966, or 8.4 percent), Maryland (71,729, or 6.6 percent), Virginia (67,820, or 6.2 percent), and Florida (46,141, or 4.2 percent). Salvadorans accounted for one of every 34 immigrants in the United States (2.9 percent), but were much more concentrated in certain states. They were one of every seven immigrants in the District of Columbia (14.9 percent), one of every 10 in Maryland (10.3 percent), one of every 12 in Virginia (8.5 percent), and one of every 14 in Arkansas (7.0 percent). In 10 states the Salvadoran immigrant population grew by more than 10,000 people between 2000 and 2008: Texas (+61,755), California (+39,531), Maryland (+29,911), Florida (+22,489), New York (+14,989), North Carolina (+14,625), Virginia (+13,116), Nevada (+11,274), Massachusetts (+11,201), and Georgia (+10,645). Los Angeles-Long Beach-Santa Ana, CA, was the metropolitan area with the largest number of Salvadoran born (274,351, or 25.1 percent of the total Salvadoran-born population), followed by Washington-Arlington-Alexandria, DC-VA-MD-WV (134,281, or 12.3 percent); New York-Northern New Jersey-Long Island, NY-NJ-PA (120,808, or 11.0 percent); Houston-Sugar Land-Baytown, TX (99,244, or 9.1 percent); San Francisco-Oakland-Fremont, CA (49,549, or 4.5 percent); and Dallas-Fort Worth-Arlington, TX (43,584, or 4.0 percent). These six metropolitan areas accounted for 65.9 percent of the 1.1 million Salvadoran immigrants in the United States. Salvadoran immigrants were particularly concentrated in Washington-Arlington-Alexandria, DC-VA-MD-WV, where they accounted for 12.3 percent of all foreign born in that metro area, and in Houston-Sugar Land-Baytown, TX (8.0 percent); Richmond, VA (7.0 percent); and Los Angeles-Long Beach-Santa Ana, CA (6.3 percent). As of 2008, 27.9 percent of the 1.1 million Salvadoran foreign born entered the country in 2000 or later, with 29.6 percent entering between 1990 and 1999, 31.3 percent between 1980 and 1989, 8.8 percent between 1970 and 1979, and the remaining 2.4 percent prior to 1970. Of the Salvadoran immigrants residing in the United States in 2008, 4.9 percent were minors (under age 18), 81.1 percent were of working age (between ages 18 and 54), and 14.0 percent were seniors (age 55 or older). Of all Salvadoran immigrants residing in the United States in 2008, 52.8 percent were men and 47.2 percent were women. Among all immigrants, 51.2 percent were men and 49.8 percent were women. Among the Salvadoran foreign born, 29.6 percent were U.S. citizens, compared to 43.0 percent among the overall foreign-born population. About 4.2 percent of the 1.1 million Salvadoran immigrants age 5 and older reported speaking "English only" while 24.1 percent reported speaking English "very well." In contrast, 71.7 percent reported speaking English less than "very well," much higher than the 52.1 percent reported among all foreign born age 5 and older. In 2008, 54.4 percent of the 938,000 Salvadoran-born adults age 25 and older had no high school diploma or the equivalent general education diploma (GED), compared to 32.5 percent among all foreign-born adults. About 23.4 percent had a high school diploma or GED compared to 21.9 percent among all foreign-born adults. On the other end of the education continuum, about 7.6 percent of Salvadoran immigrants had a bachelor's degree or higher compared to 27.1 percent among the 31.9 million foreign-born adults. In 2008, Salvadoran-born men age 16 and older were more likely to be in the civilian labor force (90.4 percent) than foreign-born men overall (80.6 percent). Salvadoran-born women (67.5 percent) were also more likely to participate in the civilian labor force than all foreign-born women (57.1 percent). Among the 472,000 Salvadoran-born males age 16 and older employed in the civilian labor force in 2008, 37.8 percent reported working in construction, extraction, and transportation. An additional 24.1 percent reported working in services (see Table 2). By contrast, among the 13.6 million foreign-born males age 16 and older employed in the civilian labor force in 2008, 25.9 percent reported working in construction, extraction, and transportation, and 17.4 percent reported working in services. Among the 305,000 Salvadoran-born females age 16 and older employed in the civilian labor force in 2008, 45.3 percent reported working in service occupations, and 12.3 percent reported working in administrative support occupations (see Table 2). By contrast, among the 9.5 million foreign-born females age 16 and older employed in the civilian labor force in 2008, 25.7 percent reported working in service occupations and 14.7 percent reported working in administrative support occupations. There were about 340,000 Salvadoran-born lawful permanent residents (LPRs) in the United States in 2008, about 2.7 percent of the estimated total 12.6 million LPRs. In 2008, 19,659 LPRs were admitted from El Salvador, 1.8 percent of the 1.1 million LPRs admitted. Salvadoran-born LPRs are the fourth-largest group of permanent residents eligible to naturalize after LPRs from Mexico, the Philippines, and the Dominican Republic. About 260,000 of the estimated 340,000 Salvadoran-born LPRs were eligible to naturalize as of January 2008. More than two-thirds (67.3 percent) of the 19,659 Salvadorans admitted for permanent residence in 2008 entered as family-sponsored immigrants (6,802, or 34.6 percent) and as the immediate relatives of U.S. citizens (6,428, or 32.7 percent). Small numbers of Salvadorans entered as employment-based immigrants (1,038, or 5.3 percent) or as refugees and asylees (590, or 3.0 percent). TPS can be granted by the secretaries of State and Homeland Security if there is an ongoing armed conflict posing a serious threat to the personal safety of returned nationals, if a foreign state requests TPS because it is unable to handle the return of nationals due to environmental disaster, or if there are other extraordinary conditions preventing the safe return of foreign nationals. TPS does not make an individual eligible for permanent residence or citizenship, and TPS beneficiaries must request work authorization from U.S. Citizenship and Immigration Services (USCIS). Temporary Protected Status (TPS) was granted to Salvadoran nationals, as well as to nationals of Guatemala, Honduras, and Nicaragua, in the aftermath of Hurricane Mitch in 1998 (see sidebar for more about TPS). It has since been extended in the wake of more recent natural disasters. The most recent extension was announced in September 2008, when an estimated 229,000 Salvadorans qualified, according to USCIS. TPS for Salvadoran nationals is currently set to expire on September 9, 2010. The Congressional Research Service's Report for Congress on Temporary Protected Status. USCIS September 2008 announcement of extension of TPS for Salvadoran nationals. The U.S. Department of Homeland Security's Office of Immigration Statistics has estimated that 570,000, or 5 percent, of the approximately 11.6 million unauthorized migrants in January 2008 were born in El Salvador. Salvadorans were the second largest unauthorized immigrant group in 2008 after the Mexican born. The estimated number of unauthorized immigrants from El Salvador has risen from 430,000 in 2000 to 570,000 in 2008, an increase of 35 percent or about 20,000 per year. Dirección General de Estadística y Censos. 2008. VI Censo de Población y V de Vivienda, 2007. San Salvador. Available online. Hoefer, Michael, Nancy Rytina, and Bryan C. Baker. 2009. Estimates of the Unauthorized Immigrant Population Residing in the United States: January 2008. February 2009. U.S. Department of Homeland Security, Office of Immigration Statistics. Available online. Wassem, Ruth Ellen and Karma Ester. 2006. Temporary Protected Status: Current Immigration Policy and Issues. Washington, DC: Congressional Research Service. Available online.